Fit-Ink: Will Wait for Chocolate? Is it Black Friday? Are we waiting for the handfuls of TVs, toys and other steals to be released to the first customers in line when the stores open the day after Thanksgiving? Are we attempting to ride the newest, scariest roller coaster at Six Flags? Are we trying to score tickets to a once-in-a-lifetime event (like the Cubbies going to the World Series)? Nope. If only it were that exciting. This is the line to pick up bibs and goodie bags for Hot Chocolate 15K/5K on November 4--and the above picture only shows about two-thirds of it. 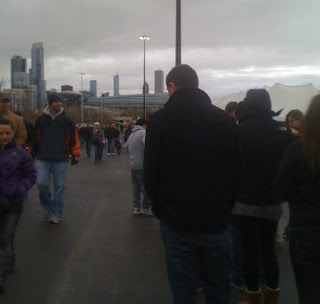 The line stretched south to McCormick Place and wrapped around to the north end of the parking lot with people waiting in line for at least an hour (I caught up with ZachRunsChicago after he had been in line for more than an hour, then I left the expo empty-handed--not having the time or warm clothing to wait--and biked home, with a chilling headwind, before he received his bib and hoodie). Um, registration fail? I've run tons of races, from huge marathons to smaller runs where you can grab your bib five minutes before toeing the line, and I've never seen anything like it. And that includes the Ironman line where you have to go through multiple checkpoints, including getting weighed, and the Boston Marathon expo where all of us with flights that landed in Boston hours before the expo officially opened lined up to wait for the doors to open. But the Boston expo was inside, sheltered from the wind and cold air. This would be an example of how not to organize a packet pick-up. 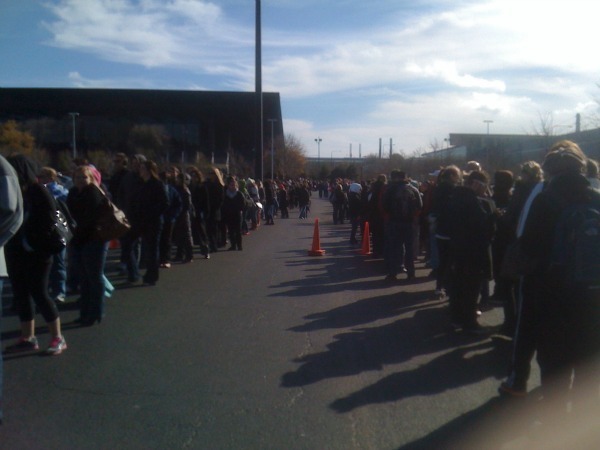 Don't make runners wait for more than an hour (more than 15 minutes would be more like it). Don't make runners wait outside in November when there's a greater chance of it being cold and miserable outside than in June. And don't change something that isn't completely broken--sure there were lines last year at Union Station but they weren't as long and seemed to be caused by a bad wifi connection that made it tough to quickly look up confirmation numbers. So much for wishful thinking that everyone running on Sunday was in line yesterday. Some of us had the same idea: arrive early. 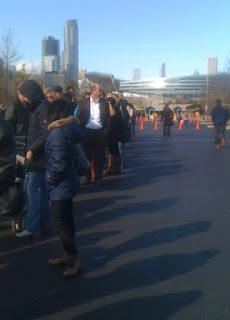 At least this line only had about a 26-minute wait, which means I'll be running for chocolate in the morning.